Ronnie won his fifth Masters title by beating Mark Selby, the defending champion, by 10–4 in the final. 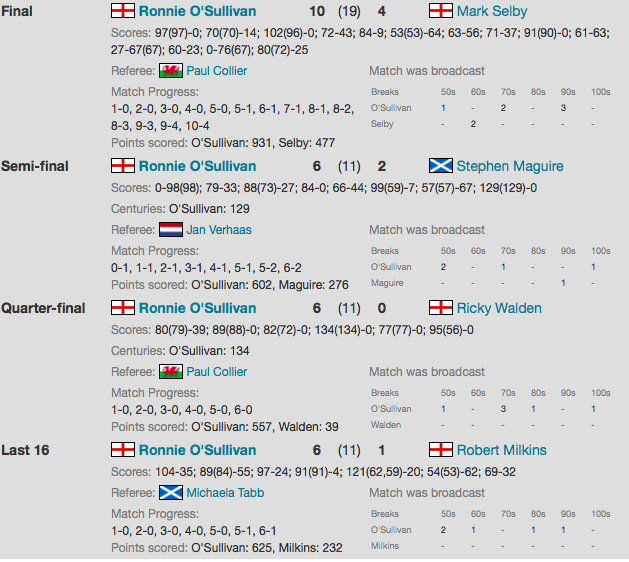 This was the third time they had met in a Masters final, with Ronnie winning in two occasions. Ronnie set a new record by scoring 556 unanswered points in a professional event in his 6–0 quarter-final win against Ricky Walden. He also set another record by reaching his tenth Masters final, surpassing the nine appearances by Stephen Hendry.